Happy Wednesday everybody! 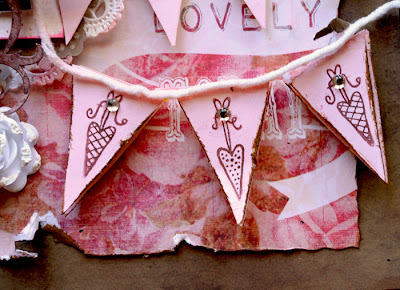 Today, I am sharing a layout that I did using some of the wonderful Rubber Cafe stamps and products. 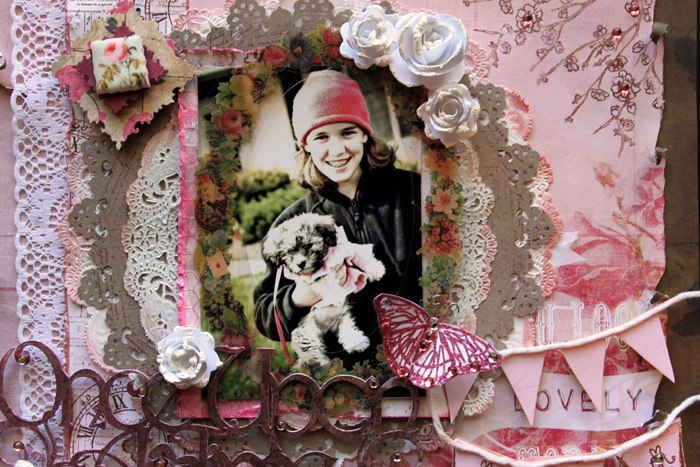 I created this layout to show that stamps can be used for so much more than just an image, it can add warmth, depth and detail to your project, just by changing the way you use it. 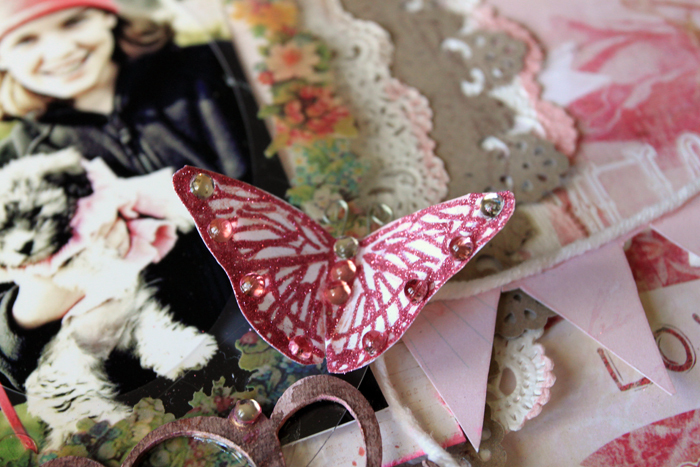 I started with 2 layers of Glitz Pretty In Pink papers. 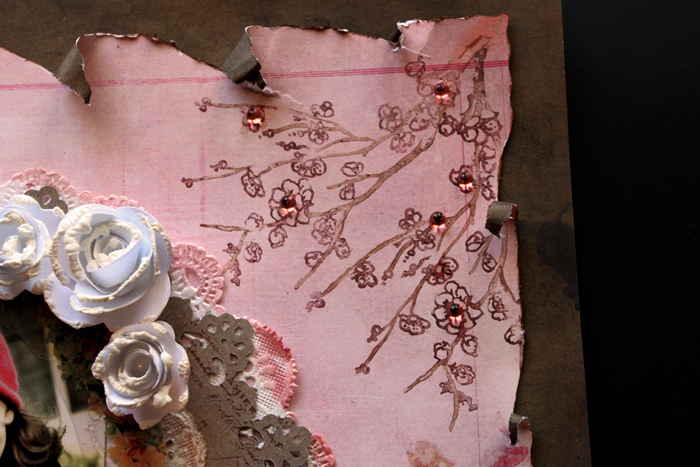 Deeply distressing and staining the edges of the 2nd layer and staining them with Tim Holtz Victorian Velvet Stain. Here I layered in some white crochet lace, then I took some cream card stock and stamped it with the Postcard Stamp from The Rubber Cafe Vintage Treasures Stamp Set with some Tim Holtz Vintage Photo Distress Ink, and then stamped over that randomly with the Clock Stamp from The Rubber Cafe Vintage Treasures Stamp Set, using Mixed Media Leather Ink, cut the paper into a strip and then distressed and stained the edges with Tim Holtz Victorian Velvet Stain, creating a decorative strip. I then cut some Glitz paper and card stock with a Spellbinder's Fleur De Lis Squares Die Set stacked them using some One and Only Tape that I turned into foam strips and are so perfect for creating dimension. I then popped on a sweet Prima Art Tile to finish it off. 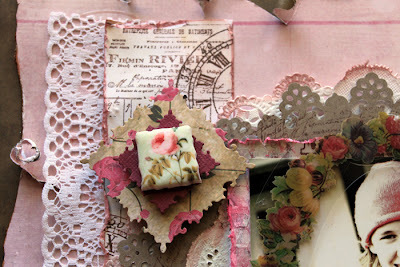 In the top right hand corner I used The Rubber Cafe Blossom Branch Stamp colored the stamp with multiple colors of Tim Holtz Distress Markers and stamped the image twice at different angles to create the image you see, then added some Rubber Cafe Cotton Candy Jellie Dots for accents. I used Dollie Layers that I stained with Tim Holtz Victorian Velvet Stain, cut a circle out of a piece of Moxie Cottontail paper, and then punched around it and then stamped it with the Postcard Stamp from The Rubber Cafe Vintage Treasures Stamp Set, using the stamp to create a nice dimensional printed piece to layer with. I layered the photo in and then topped it with a Glitz Peek A Boo. I cut some banners out of a piece of the Glitz paper cutting a second layer, then I stamped the pieces with The Rubber Cafe Heart Strings Stamp, layering the pieces on top of one another using some One and Only Tape that I turned into foam strips, attached some Rubber Cafe Crystal Clear Jellie Dots and attached some trim to create the look of a banner. I added in a second, plain banner. Created some rolled flowers using The Rubber Cafe White Puffies to add texture and dimension. I colored the FabScraps Title with layers of Tattered Angels Mists, then added on some Rubber Cafe Crystal Clear Jellie Dots for accent and bling. For the finishing touch, I used The Rubber Cafe Flat Wing Butterfly Stamp stamped the image onto white card stock, then glittered the image using Your So Fine Princess Pink Glitter and then blinged it up using some Rubber Cafe Crystal Clear Jellie Dots and Rubber Cafe Cotton Candy Jellie Dots, and added a silver wire antenna. 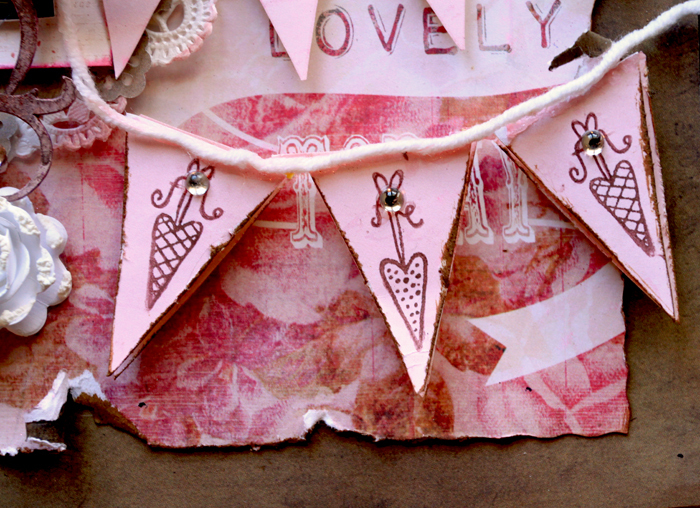 See how much warmth, depth and detail you can add with stamps! I love them!! They are little images, that you can use over and over in so many different ways to get as many different looks as your imagination can create. They are definitely money well spent, because they can be used endlessly! Beautiful!!!! 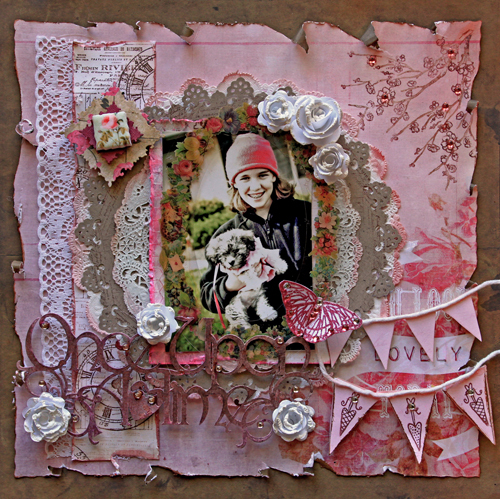 Love this layout Renea. So much detail and beauty in such a small space. I don't how you do it girl! It's GORGEOUS!!!! Such a gorgeous layout! I can't beieve all the amazing details and great products you managed to pull into this in the process. Really beautiful! 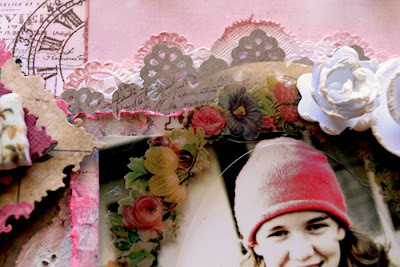 oHHH wow....you know I love shabby and this is jst gorgeous with all the layers...and tht little banner.....love! Wow! Fantastic page!I adore pinks and the photo is so lovely.